Greek authorities have arrested the captain of a Freedom Flotilla II ship after his attempt to sail off for Gaza despite a ban slapped on the fleet by the Greek government in order to prevent the humanitarian aid flotilla from leaving its ports. 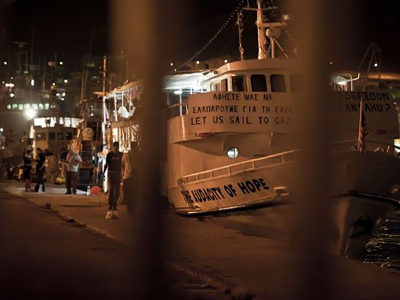 ­John Klusmire, a US citizen and the captain of the Audacity of Hope ship, was arrested on Friday night after his attempt to leave the Greek port of Perama and head for Gaza without obtaining permission from the port authorities. Greek authorities accuse the 60-year-old captain of endangering the lives of 36 passengers of his boat along with four crew members and at least ten journalists. John Klusmire is being held at a police station near Athens, in the port of Piraeus, while the ship was towed to a naval base, the Associated Press reported. According to Greek law the captain could face up to two months in prison if found guilty of violating port authority orders. His hearing is scheduled for July 5. Nadezhda Kevorkova, an RT correspondent reporting from Freedom Flotilla II, says the captain of the American ship knew what he was doing, and he was determined in his attempt to leave port. Meanwhile, the activists have gathered in the center of Athens to protest against what they call the unlawful treatment and to demand the release of their vessels. A few delegates were chosen to engage in talks with authorities to secure the release of the captain held in custody and let the ships sail to Gaza. The humanitarian mission includes Members of the European Parliament. They are planning to apply pressure to the EU and the UN to persuade Greece against illegally keeping the vessels in ports. The activists remain optimistic and hope justice will prevail. 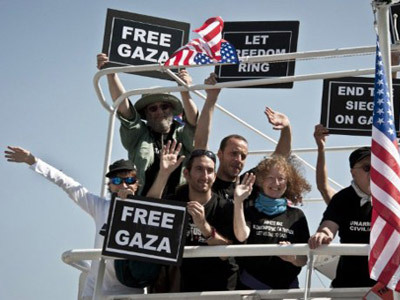 They believe the fact that the flotilla has caused such a stir is because it is the symbol of enormous moral strength. Israel has been spreading speculation there are chemical weapons on board. But if that were true, Kevorkova says, the ships would have been searched – every nook and cranny. 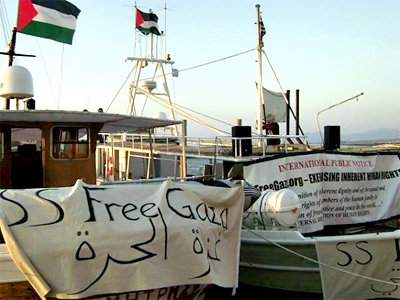 The flotilla is drawing parallels to a similar Gaza-bound convoy that was stormed by Israeli marines in May last year, resulting in the deaths of nine Turkish activists. 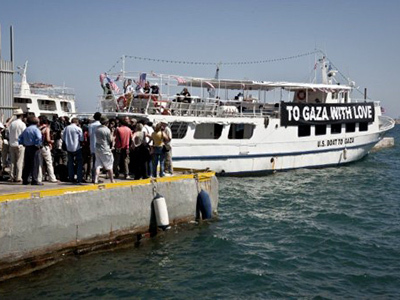 Meanwhile, according to Rami Abdo, a spokesman for the European Campaign to End the Siege on Gaza (ECESG) – one of the flotilla organizers – some unidentified divers, allegedly from Israel's Mossad intelligence service, sabotaged the engine of one of the Flotilla’s ships that was anchored in a Turkish port, the RIA Novosti news agency reported. However, Flotilla spokesman Dror Feiler said there was no direct evidence Israel was involved, the Jerusalem Post reported on Thursday. The Israeli government denied the accusations, and the Turkish authorities also said there is no evidence the ship was somehow sabotaged.